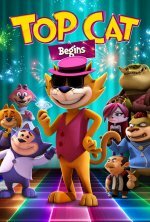 Top Cat Begins release date was Friday, September 29, 2017. This was a Limited in theaters release. Witness the beginning of the world’s most audacious cat, Top Cat! Poor, lonely and living on the streets, Top Cat is one sad cat, until a chance meeting with Benny, a naïve and good-hearted feline looking for adventure. The pair quickly become best buddies - and partners in crime - pickpocketing their way out of poverty. Setting their sights higher, they decide to steal from Mr. Big, who rules New York’s backstreets. As Top Cat and Benny hatch a plan, little do they know, success is just the start of their problems.